Jeanne D’Arc – AKA Joan of Arc – was a 19 year old French chick who was burned at the stake in France in 1431. Jeanne D’Arc connection, May 30, 1431. Source, revdrron.blogspot.com/. Bob Dylan – “How Does It Feel” to be 70? NEW MATERIAL HERE – REVISED, Friday May 27th at 10:00 PM Mountain time. Somehow, a chorus of “Happy Birthday” just doesn’t cut it for Bob Dylan, the Poet Laureate of his generation, today as he hits the milestone of 70. First and foremost, Bob didn’t write it. Not surprisingly, the momentous occasion is being observed in many quarters. Rolling Stone magazine has devoted the cover of its latest issue to him, for a story listing the 70 greatest Bob Dylan songs as selected. And—gulp!—AARP magazine, the publication of the American Assn. of Retired Persons, also has a Dylan cover piece in which the editors coaxed Bruce Springsteen, Bono, Judy Collins, Mavis Staples and Martin Scorsese into writing a few words in recognition of their peer/hero and/or friend. I’m going to add to the story. I was still living with my parents when I first heard Dylan on AM radio. I don’t remember the song, maybe “Subterranian Homesick Blues?” Whatever it was the jacket was on the wall above my bed and I listened constantly. It was like the second coming. I’d been through Elvis and that was really cool. Dylan did it again. I listened – and played and listened and played from the Dylan music that appeared shortly after the “Minneapolis hotel tapes” as I understand through his 70th Birthday. I still have questions. How did he do it? Where did the music/poetry come from? Knowing Dylan’s apparent clear honesty and crystal integrity why did he change his name? Did he have an issue with his being Jewish? BOTTOM LINE – DYLAN WINS! "From the cesspools of excitement, where Jim Morrison once stood..." go lyrics from the Frank Zappa song "Tinseltown Rebellion." Not a cesspool, but equpped with a swimming pool, the Tropicana Motel, at 8585 Santa Monica Blvd. in West Hollywood, California, was a place where Morrison stood, ate, and did other rock-star things. Other rockers favored the location as well. The median strip is the former right of way of the Pasadena and Pacific Railway, later the Pacific Electric Santa Monica Boulevard/West Hollywood line, and finally the Southern Pacific West Los Angeles branch. The motel was torn down within two years after this photo was taken. 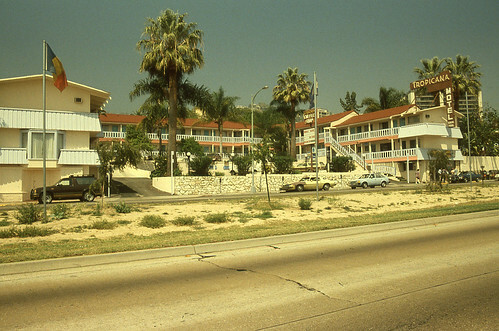 4/7/1985"
At one point, this hotel/motel was the property of baseball great Sandy Koufax. Sadly, it was torn down in 1988 and an unattractive Ramada Inn built on the site. In the 1960's and '70's, the Trop was the West Coast base of many musicians. It was often the first hotel sort of place many band members stayed at on their first trips to Los Angeles. There were several bungalow [sic] behind the motel that offered more private lodging. The Tropicana was basic and affordable. It was located on Santa Monica Boulevard close to the clubs in West Hollywood and the west side. There are many stories of long, late-night parties going on there in the '60's and '70'. Jim Morrison of the Doors lived there, and would often spend days sleeping off his party binges. Chuck E. Weiss, Tom Waits were residents too. Frequent guests included Janis Joplin, Van Morrison, Bruce Springstein, Eddie Cochran, the Beach Boys, Jim McGuinn of the Byrds, Led Zeppelin, Guns and Roses, Martha and the Vandellas, and Frank Zappa, whose "freak-outs" were legendary. It was a first stop on the way up the rock and roll ladder, as well as a place to stay once you'd made it. The big record companies grew on Santa Monica Boulevard and the Sunset Strip during this era, and made LA the rock and roll recording center of America. Dukes Coffee Shop was located at the Tropicana motel on Santa Monica Boulevard in West Hollywood. "Harold Camping, the 89-year-old retired civil engineer, who founded Family Radio Worldwide, an independent ministry that has broadcasted his prediction around the world." "Given that the end of the world was supposed to be nigh, it perhaps wasn’t surprising that Christian doomsday prophet Harold Camping had shown some reluctance to take advance bookings. The 89-year-old Californian preacher and radio host had prophesied that the Rapture would begin at 6pm May 21st in each of the world’s time zones, with non-believers wiped out by rolling earthquakers, as the saved ascended into heaven." "His refusal to schedule a media interview for the following day - “It is absolutely going to happen. There is no way that I can schedule an interview because I won’t be here.” - was being replayed by media as the world firmly stayed standing." "On the microsite Twitter, groups of atheists and sceptics were last night swapping tales of After Rapture parties, with one group, in Tacoma, Washington, branding their celebration “Countdown to Back-Pedalling”. Some say that the beginning of the END will start on May 21, 2011. Plan your Rapture parties now, if you wait it will be too late. How ’bout beautiful Blondie’s “Rapture”. The funky bass-line will send you on your way. The Moon will be 100% full May 17, 2011 at 4:08 A.M. Las Vegas time. “American Indians gave names to each of the full moons to keep track of the passing year. The names are associated with the entire month until the next full moon occurs. Since a lunar month averages 29 days, the dates of the moons change from year to year. Here are titles most closely associated with calendar months.” Two Native tribes are mentioned here – click the WWU link to access more information. Mohawk, Eastern Woodlands – Mohawk, the most eastern member of the IROQUOIS Confederacy, resided on the banks of the Mohawk River. Haida, Northwest Coast – Haida live along the coastal bays and inlets of the HAIDA GWAII of British Columbia (QCI). 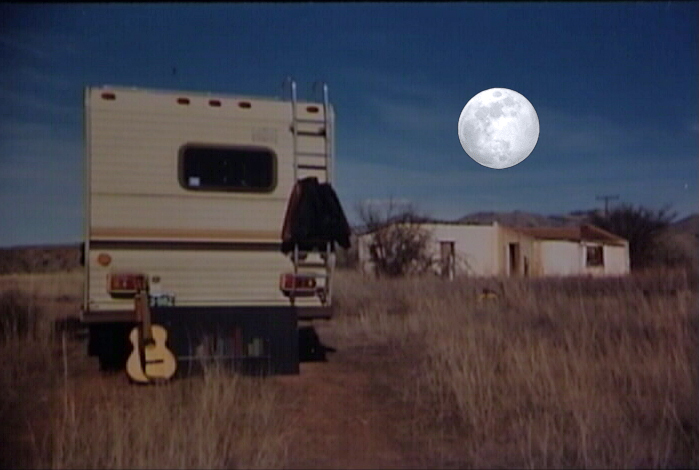 The photo at top is of the Full Moon over an abandoned Adobe – near the border at Tucson, AZ. I’m ALL IN for Mette Lindberg, and “The Asteroids Galaxy Tour,” and their song, “The Golden Age” – with a pair of aces! One’s the Ace of Diamonds the other is the Ace of Clubs. This video contains the song by that blonde, Mette Lindberg and her band “The Asteroids Galaxy Tour.” The song is “The Golden Age.” I’m old and half/square and way behind on this one, but nevertheless – I’m All In. I know that the song is at least eighteen-months old and has a track record. It is as compelling as anything I’ve ever heard. It almost has a fifties, girl-singer R&R sound. But definitely contemporary – influenced I’m sure, by Amy Winehouse, who I understand is promoting the band. There’s a little bit of Blondie’s “Rapture.” in there somewhere. Tinkling upright-piano keys, lagging snare and Mette’s little-girl voice start the tune, after Ms Lindberg swings a slender hip in – in-sync with the first snare hit. At the chorus her voice is doubled with one of the tracks a few clicks behind the beat creating a heavy echo, or they simply used an echo-effect, whatever. Clean, tasty punctuating horns end the chorus, then the little-girl voice returns with another magnetic verse. The second chorus is loaded with the rising horns punching on 2 and 4 and a flute weaving an improvisation. Guys (or gals,) if you don’t want to cuddle with this girl you’re dead and ain’t coming back. The video showcases Mette, in a little black sequined dress (looking a bit like, Catherine Deneuvre,) with the band – performing in an arched ballroom at a Golden Age formal, house-party. Guests in dinner-wear are mingling in the up-scale mansion as a martial-artist does his thing, and someone scores two points dropping a basketball in a hoop which just happens to be set up in the fancy ballroom. Luscious scenery/sets/costumes. The chorus is a very sharp hook and it stuck me. I’m stuck as well on Mette Lindberg. Is this song already a hit or was it ever? Cuz, if it isn’t it should be. “Their debut single, “The Sun Ain’t Shining No More”, was released on September 15, 2008 on their own ‘Small Giants’ label. The band is perhaps best known for their single “Around the Bend”, which was used in an Apple iPod Touch commercial starting in September 2008, and was released as a single in December 2008. Interview with Mette Lindberg on YouTube. 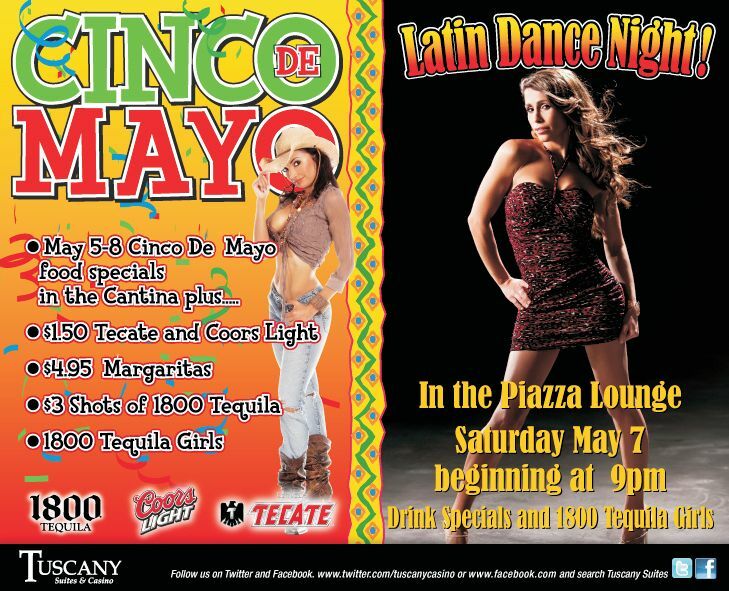 First of all, Cinco De Mayo has nothing whatsoever to do with a Fifth of Mayonnaise. “Las Vegas casino events come in all shapes and sizes. Sometimes they are not even called events.